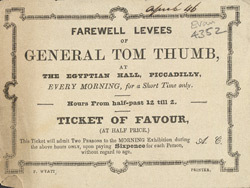 This is an admission ticket for a showing of a circus oddity, held at the Egyptian Hall in Piccadilly.Charles Stratton was one of P. T. Banum’s principal ‘exhibits’ and toured Europe and America as ‘General Tom Thumb’. He was just three feet and four inches tall and was displayed along with giants, bearded ladies and strong men as a curiosity. In England he appeared at the Royal Egyptian Hall was an immediate success, he became one of the most talked and written about ‘celebrities’ of the 19th Century.